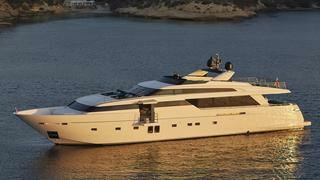 The 31.78 metre motor yacht H1, listed for sale with Yacht Moments, has had a €1,000,000 price reduction. Launched in 2014 by Sanlorezo as part of the Italian yard's SL118 series, H1 features exterior and interior design by Francesco Paszkowski. Built in GRP with teak decking, she is powered by two 2,637hp MTU diesel engines to a top speed of 27 knots, a cruising speed of 24 knots and a maximum range of 1,406 nautical miles at 11 knots. One of the features that makes this yacht for sale stand out is her wide body superstructure, which means the space at her bow can be better exploited. Her interior layout and décor hangs on the concept of a limitless interior, which is completed in a minimalist, grey and white scheme. Glass is a prominent feature of H1’s interior, shown in the use of glass in the lower deck bulkheads that give the impression of a larger yacht, the lateral window in the saloon that opens, and the glass handrails on the flybridge that offer uninterrupted panoramic views. She can accommodate eight in four cabins on the lower deck amidship, with space for five crew located astern. The guest accommodation consists of one master suite, with two balconies, one VIP suite and two twin cabins. On deck, the side passages at the front of the yacht have been moved to the deckhouse. Her flybridge features a bar as well as plenty of space for relaxing and sunbathing, with a dining table on the main deck aft. H1 is now asking €8,500,000 with tax paid.